Key Difference: Doctorate, this word has been derived from the Latin word “docere”, meaning "to teach." A doctorate is the highest academic degree or a professional degree, awarded by a university for the successful completion of a specific programme of study. On the other hand Doctoral refers to adjective meaning of or relating to a doctor or doctorate. This simple difference makes this comparison more interesting; for example a dissertation prepared in order to achieve doctorate is known as a “doctoral dissertation". Doctorate, this word has been derived from the Latin word “docere”, meaning "to teach." A doctorate is the highest academic degree or a professional degree, awarded by a university for the successful completion of a specific programme of study. On the other hand Doctoral refers to adjective meaning of or relating to a doctor or doctorate. This simple difference makes this comparison more interesting; for example a dissertation prepared in order to achieve doctorate is known as a “doctoral dissertation". Ph.D.is categorized as research doctorate whereas MD (Doctor of Medicine), DPT (Doctor of Physical Therapy) etc are grouped under professional doctorates.One should not confuse between the two as both refer to the same thing. 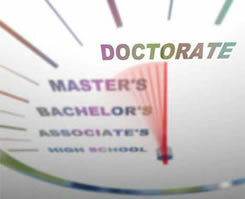 Doctoral is adjective that defines anything possessing characteristics of a doctorate. All the degrees providing doctorates are considered as doctoral degree. This also includes honorary degree that is awarded by the university to recognize an individual's contributions to a particular field or philanthropic efforts.Doctorate covers both researchers and highly skilled practitioners whereas Ph.D. is primarily focused on researchers. Most of the universities have set Ph.D. as minimum qualification for recruitment of teaching staff. Both are postgraduate studies and recipients of both are considered to possess deep knowledge of specific field. Thus one can refer to anydoctorate related thing or activity as doctoral thing or doctoral activity. Hence doctoral is used in context to doctorate or pertaining to a doctor.